Scala Storage is a scale out storage solution designed for large-scale, data-intensive applications. ScalaFS is a fully POSIX-compliant parallel file system. Scala Storage Scale-Out solutions provides the best price and performance storage solution. Scala Storage has proven customer successes in Internet, oil & gas, life sciences & bioinformatics, media & entertainment, video surveillance, education and government for high performance computer (HPC) storage solutions. Scala Storage capacity and performance is based on linear expansion. Based on a non-disruptive systems expansion and predictable capacity and performance increase, Scala Storage Scale Out-Solution provides best ROI for your storage budget and growth. Scala Storage is designed for data & metadata intensive workload. It utilizes ~90% of network performance. Scala Storage File System (ScalaFS) is optimized for both large files (>10GB) and small files (KB-sized). Large files are striped as 64MB sections across storage (iStore) nodes. The aggregate throughput grows linearly when adding more iStore nodes. With the world’s leading clustered metadata technology, ScalaFS enables the support of large directories and fast filename lookup, ideal for Big Data/Cloud management. ScalaFS Supports up to 4,000 computing nodes, with hundreds of GB/s aggregated throughput. Metadata servers can also scale up linearly. Scala Storage supports more than 200 billion filename lookups with up to 128 metadata servers, offering hundreds of thousands of files per second. Scala Storage systems are designed with no single point of failure. Both data path and data storage have built-in redundant paths in order to prevent possible down time. In addition, Data is replicated across iStore node networks to prevent disk, server, or network failures. Built-in automatic failure-detecting mechanisms can detect hardware failures and the self-healing process provides recovery automatically. The process is completely transparent to applications and no manual recovery is required. Compared to traditional RAID controllers, recovery time is only 1/5 of the time required to recover from hard drive failure. Traditional storage uses RAID as the physical unit and LUN as the logical unit, which limits data allocation and tends to result in an unbalanced load. 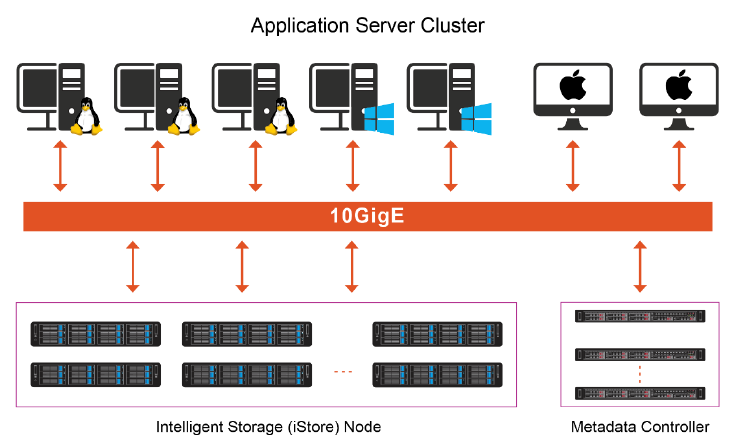 Scala Storage evenly distributes data and replicas in parallel to different iStore nodes, ensuring all disks have the same level of utilization. When customers add new servers for more capacities, system workloads will be balanced automatically to maintain the utilization and increase the overall performance. Scala Storage provides a complete solution for your storage needs. With predictable performance and capacity to increase by adding additional iStore nodes, you only need to pay as you grow. Our price/performance solution is competitive to all of the other commercial scale-out solutions. All storage solutions are preconfigured with either 144TB or 216TB configurations. Deployment takes less than 15mins. With automatic load balance and non-disruptive upgrade, iStore nodes can be added with just a few clicks to scale out the solution which are all transparent to the application servers or computing nodes. Scala Storage includes a centralized management GUI, ScalaManager, to configure, manage, and monitor the systems. One administrator can easily manage a cluster with PB levels of storage. Scala Storage has redefined storage solutions to solve these challenges with Scala Storage Scale-Out System, Scala File Systems and ScalaManager. These storage solutions implementations are designed for enterprise, private and public cloud computing, and are delivered across a variety of industries. Scala Storage is scalable from hundreds of terabytes all the way up to petabytes, while still providing predictable increasing linear performance and high availability storage structure. The Scala Storage family delivers extreme capacity and performance, and significantly reduces an organization's capital expense, operational expense and total cost of ownership.